And those of you who didn’t take literature in school ask: Who? He’s the Irish author of The Commitments, The Woman Who Walked into Doors and now, The Dead Republic. And, if the reading I attended is any indication, he would make the coolest dinner guest ever. 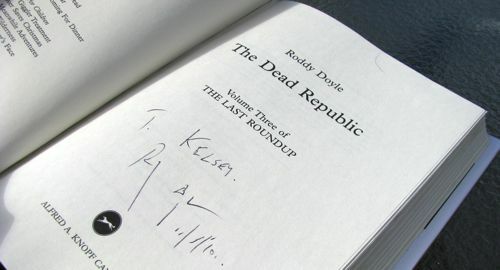 Nerd that I am, I had him sign The Dead Republic. The unfortunate thing about it? It’s volume three of a trilogy. Which means there are about 800 pages standing between me and it. The event must have inspired me. 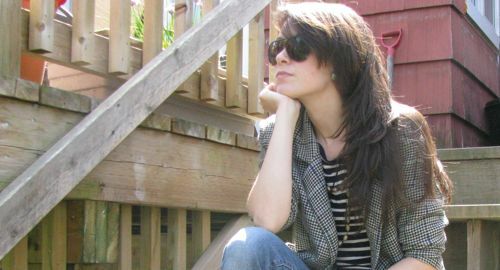 Because the next day I showed up dressed like a middle-aged author: tweed jacket, driving shoes and all. With some bohemian touches: hippie dippy necklaces. I made the red and silver one, and I found the pendant in Playa del Carmen, Mexico. It’s from a little shop tucked away in a picturesque courtyard off 5th Avenue (between Calle 6 and 8, in case you’re headed there). My driving shoes? 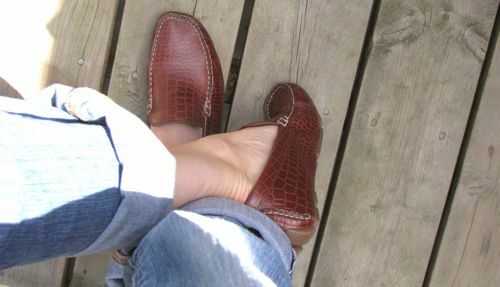 They’re from a far less quaint source: Cole Haan. P.S. Speaking of books: Facebook! if i could meet one roddy it would probably be roddy piper. I have this creepy desire to sit in your closet and stare at all your clothes. How is it you always have such perfect things to wear? Love this entire outfit. Amazing. And you couldn’t have asked for a better muse. You know, I’ve never paid attention to driving mocs before. But suddenly I’m seeing them on tons of bloggers and they look awesome on everyone (including you)! Kelsey, you look great! 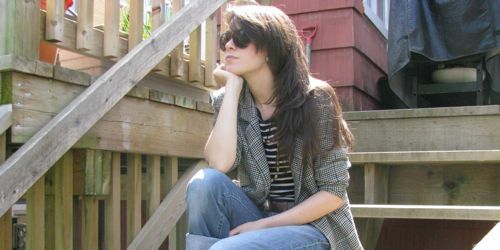 I love the tweed blazer and the Cole Haan driving shoes, and the cuffed jeans–I’ve been having a bit of a cuffed jeans moment this season so I’m all for that look. cute! love your hand made jewelry and esp. the silver pendant. i’m very inspired by mexican design lately. might have something to do with reading your blog and seeing all those vibrant colours. love it! really digging the mexican jewelry. 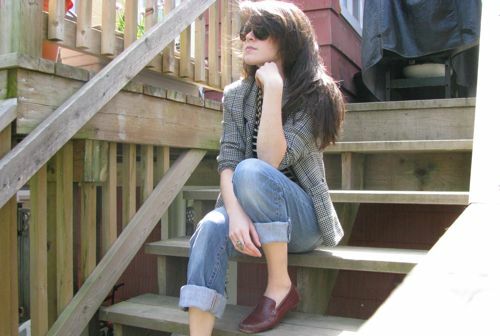 and those cole haan’s…to die for! they look so insanely comfy. Love the shoes! I love masculine pieces, especially when you have long girly hair or girly makeup. These suit you, great work! 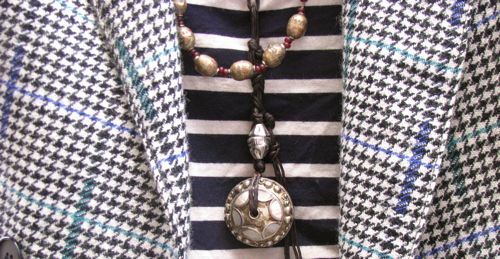 The plaid herringbone blazer with the striped tee is an amazing combination. I find this look very inspiring, one of my favourites of yours! Perhaps I share the urge to dress up like a middle aged author? hmmm… so i came upon your article from this other site that wrote about some diet solutions? Anyways, i took the time to read your topic but i’m slightly confused… Either way, you’re a good writer and i wanted to take the effort to write a thank you! I’ve bookedmarked your site for future reference. Hi, just wandered by. I have a Cole Haan website. Truly more information than you can imagine on the web. Looking for something else, but cool site. Have a nice day.